London never looks better than at nighttime, and whichever month you go you’re bound to enjoy an evening of style and spectacular sights of the London skyline. The River Lights Cruise celebrates the evening view of London from the height of the River Thames. With a glass of bubbly in hand and delicious canapes being served throughout your two hour cruise, your trip up the river will be accompanying by a selection of jazz standards and chill out pop songs from our great live singers. Glide past London’s landmarks, including the London Eye, the Tower of London and the majestic Tower Bridge, either from the comfort of the main saloon, or out in the open air on the panorama deck. It’s the perfect way to end the day and get your evening started in a sophisticated fashion. 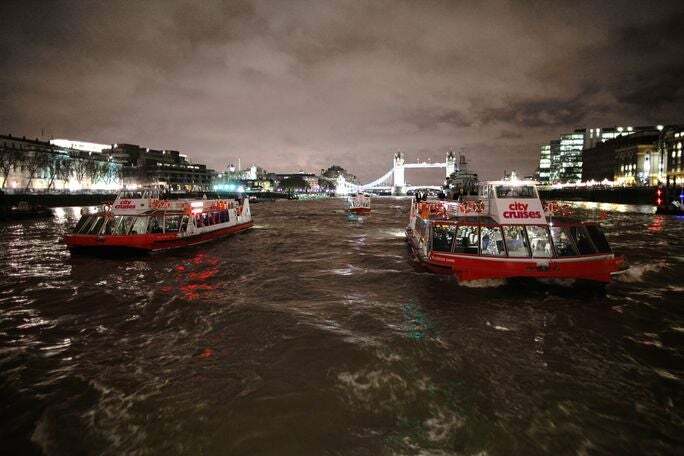 Please note passengers must be 18 years of age or older to travel on the River Lights Cruise. Unfortunately this vessel is unable to accommodate wheelchair users. Recommended to arrive at least 15 minutes prior to boarding time. No under 18’s are allowed on this cruise.